Amidst the Marvelcution, do you know what some of us used to fantasize? To repeat if you missed it, the other writers and I, the artists, inkers, letterers, editors, the bruised, bloodied virtual Bullpen? We used to speculate that Marvel’s corporate owners would dump their debt-laden company… and a global media player would pick it up. And instead of strip-mining the company, its assets and the distribution system, this global player – a Sony, a Paramount, a Disney – would set up a state-of-the art killer vertical, cross-pollinating global media with our stories – and we, our people like us, fans of these characters and the work of those who preceded us, could go on creating. Comics would be more than Franklin Mint collectibles again. Instead of death by attrition, in those slow bandwidth days, visual storytelling would splash back into the mainstream. Found in comic shops, sure. But also every bookstore. Online. Even in theme parks… See where I am going? Disney’s owned Marvel since the fourth quarter of 2009. And it’s changed everything, right? No. Maybe I’m wrong, but Marvel characters, now ubiquitous in globally successful movies (how different is that from the 90s?) got there on their own. It took decades, but Marvel moved toward producing its own media rather than simply renting out the characters and… magic. And publishing? Did our daydream come true? Well, you tell me. Fortunately for my friends still toiling on staff and chipping away at freelance assignments, Marvel’s showing no signs of shuttering comics on paper. Presumably the relatively steep price tag on current print / digital issues helps, because average top tier sales numbers would have barely scraped the top 100 in the early-to-mid 90s. No, it seems Disney’s C-Level is watching profits quarter to quarter, but not involved in characters or content – or involved so minimally it’s transparent to casual readers. And what about distribution? That old fantasy we used to indulge in, bringing comics to the mainstream again? Has the multi-national Disney souvenir store brought Marvel characters to the world in every format and every language? Diane and I took our six-year-old daughter to Disneyworld last November. I kept one eye open for evidence that Disney was selling Marvel. And I saw… nothing. Granted, if I was looking for comics, I wouldn’t have found any – not even comics with Mickey, Minnie and Donald. I saw very few books / print publications for sale at the park, period – they must be a lower-margin sale, and more difficult to inventory and sell through than apparel, accessories and toys – but I didn’t see a single Marvel character on these products either. Exception that proves the rule: I did see two adult men in Marvel characters shirts – an FF logo and a Jim Lee Wolverine drawing – but these looked like older tees on older guys, not park purchases. Princesses galore, pirates for the boys… but no Peter Parker, no Punisher… not even a Power Pack. The storytelling / theater geek way I’m bent, I couldn’t help but play imagineer for a day. In line to buy lunch for the family, this imagineer for a day was seeing, at least in my mind, a 360 degree What If? Marvel Universe in between Adventureland and Tomorrowland. The Marvel rides. Xavier’s School for the Gifted: fight simulated Sentinels with Wolverine and Kitty Pride in the Danger Room, hit the Beast’s lecture hall, then food fight with your fellow muties in the cafeteria. Spider-Man: swing through the Big Apple by night to save Aunt May, Gwen Stacy and JJJ from the Sinester Six! Avengers! Arena Earth: Join the intergalactic Kree / Skrull War With Iron Man, War Machine, Thor, Captain America, the Falcon etc. Inhumans: You survive an airline crash to discover Attilan, a secret Shangri-la for a bizarre race of superbeings. Now convince them that your accidental incursion is not a first strike by humanity on their home to avert a holocaust. And then I woke up. Twilight Zone. Pirates of the Caribbean. Dumbo the Flying Elephant. But no Fantasticar. No Black Bolt, Medusa and Lockjaw. 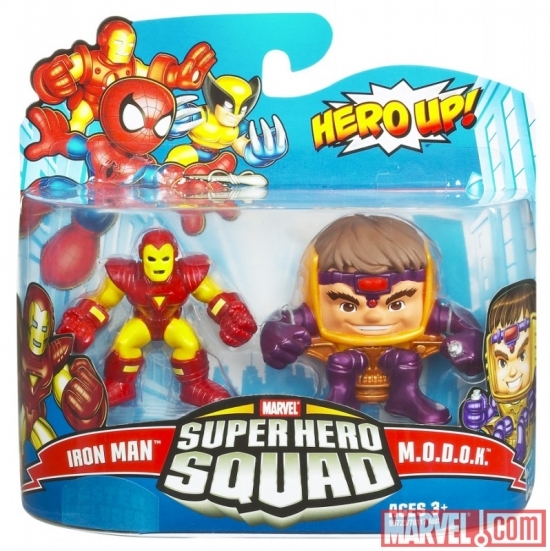 Not even one, little tiny M.O.D.O.K. These things take time. Imagineers actually employed by the Mouse could be working on all of this. (Hey, get in touch…) Still, the fourth quarter of 2009… that’s a lot of quarters slipping by without, as they say up in the expensive seats, ahem, leveraging this branded content. Look how fast the Pixar characters became Disney-mainstream. I’ll be watching to see where this goes… what would you like to see? Remind David Quinn some time to tell you about how he worked on the first Faust movie inside the Disney Animation Building in Burbank… for one day.